Upgraded Air Vent Grip, extremly steady - Just Press the release lever and insert onto the air vent blade. No tools required. Fits thin or thick air vent blades with ease! Just insert onto the air vent blade, then tighten the nut. The innovative ballhead joint allow fully 360° rotatable twists giving you the ultimate flexibility in viewing the GPS from any angle. 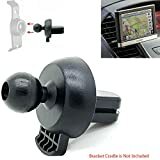 Note: Recommended to install the mount on the bottom blade of the air vent. Make reading fun and simple with the Aluratek Libre AEBK01WF eBook Reader PRO! The AEBK01WF features a 5-inch widescreen LCD with ePaper Technology and includes 100 preloaded eBooks such as 20000 Leagues Under the Seas, Adventures of Huckleberry Finn, Don Quixote, Dracula and much more! With the AEBK01WF, you can listen to MP3 music and view digital photos. Plus, its memory is upgradable with the Secure Digital/SDHC card slot up to 32 GB (2 GB card included!) so you can download your favorite books from the internet or off your computer. The Aluratek Libre features a sleek slim design that allows you take it anywhere.In addition, you can view the screen in either portrait or landscape mode. If you're looking for the ultimate portable library, this Aluratek Libre AEBK01WF eBook Reader PRO is for you! Order today! Franklin eBookMan EBM-901 provides you with the best reading experience available in pocket-size electronic format. Use eBookman cartridges, download books and MP3 music and read or listen to them anywhere at anytime. It is also a PDA device - letting you Record your voice and take notes in your own handwriting, make schedules, appointments and to-do lists. The array of programs comes in the package with your eBookman device, others can be purchased or downloaded form the Internet. Install the included dictionaries on your eBookman using the standard installation procedures. With this eBookman you can read, listen to music, organize your activities and easily handle translations with help of the 7 dictionaries included! Language pairs: English<->Dutch, English<->German, English<->Italian, English<->Portuguese, English<->French, English<->Swedish, English<->Spanish. Each of the 7 dictionaries has a word base of 400,000. Display: 16-level grayscale display and high-resolution touch screen with enhanced polarizers; Hardware features: USB port. MultiMediaCard (MMC) slot. Headphone jack. Speaker. Microphone. Backlight; Accessories: Stylus. Removable lid. Cradle with USB connector (serial cradle sold separately); Memory: 8 MB SDRAM. MMC slot for expandable memory; PC system requirements: IBM-compatible 486 PC or higher. 256 color VGA monitor. Mouse or other pointing device. Windows NT 4.0, Windows 98, or Windows 2000. 50 MB free disk space. 32 MB RAM (recommended). available serial or standard USB port3. Internet connectivity. Microsoft Internet Explorer 4.0 (or later) OR Netscape Navigator 4.02 (or later); Desktop software: eBookMan Desktop Manager with Outlook synchronization powered by Intellisync for eBookMan; Core applications: Franklin Viewer. Franklin Reader. Audiobook Player. Music Player. Date Book. Address Book. Voice Memo. Memo Book. ToDo Book. Calculator. Customer Made for Barnes & Noble Nook E-Reader, FITS PERFECT!!! Openings for all ports on your Nook!!! Kroo Silicone Skin Case for Nook ... This unique book cover is not only stylish, but offers optimal protection and comfort. 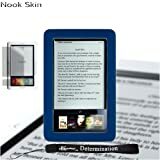 Protects your Nook eBook Reader from Bumps Dents and Scratches, it''s easy to travel with. Looks Slick and Professional, Fits almost anywhere. Its made of High-quality silicone, making it stronger, durable and longer lasting. This lightweight cover is contoured to fit Nook Reader smooth, rounded edges. Reading with the cover on, you can easily access Nook''s navigation features and power switch, while still enjoying a perfect fit in your hands. Having a skin case will also protect your Nook even when is on a backpack or any type of storage. The silicone skin it's a smooth non-texture design, giving your Nook book reader a sophisticated look. 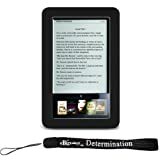 ...Made More Durable, Slimmer, and lighter but still protecting your Nook eBook Reader Device... Includes a 4-inch eBigvalue Determination Hand Strap plus a full screen protector for your nook. This screen protector will protect your top and bottom screen from scratches and finger prints. The days of running to the bookstore to pick up the latest novels are over with this new eBook Reader from RCA. With the eBook you can instantly download and access the newest books and your favorite magazines instantly. The large, color LCD screen lets you comfortably view your favorite selections while the convenient touch screen lets you turn pages, make notes or adjust screen and font size. And the 56K modem or Ethernet connection lets you download new selections in a snap. RCA has brought reading into the digital age with the RCA eBook Reader. With the eBook you can access hundreds of titles instantly by connecting to any analog phone line. The backlit LCD screen lets you easily and comfortably catch up on all the latest novels, newspapers and magazines. Convenient touch screen entry allows you to move pages backward or forward, add bookmarks or make notations. Downloading new books is simple with the built-in 33.6 modem, so there's no need for a PC.